Personally, I find that dressing for a special occasion can be equally fun and stressful. Fun because special occasions are usually happy events, but it can be stressful because all of us want to look our best. Moreover, there are certain restrictions. For example, when it comes to wedding, you don't want to wear white or even a colour that may look white in the photographs. Some newly weds even restrict their guests in the choice of colour. In addition, when it comes to occasions that might be religious in nature, or may take place in a church or other holy spaces, you want to make sure that what you're wearing is appropriate for that event. So, we all want to look our best but we don't want to take the attention from the person who is celebrating that special something. It is kind of tricky isn't it? Right now, our social calendar is really busy. We have been attending christenings, first communion and confirmations every weekend. We've been to two weddings so far and we're invited to many more. My husband has a lot of friend and we seem to be invited to everything. Since choosing the right dress seems to be something I do every weekend, I can tell you what helps me pick out a dress. Often I find it liberating to focus on a certain colour or a cut because that makes it easier for me to choose the right dress. My mood also plays a part in it. I might feel like wearing something different from time to time. Similarly, maybe there is a trend you have been excited about, and that special occasion or date night might be the perfect opportunity to try it out. Shopping our closets is also good. 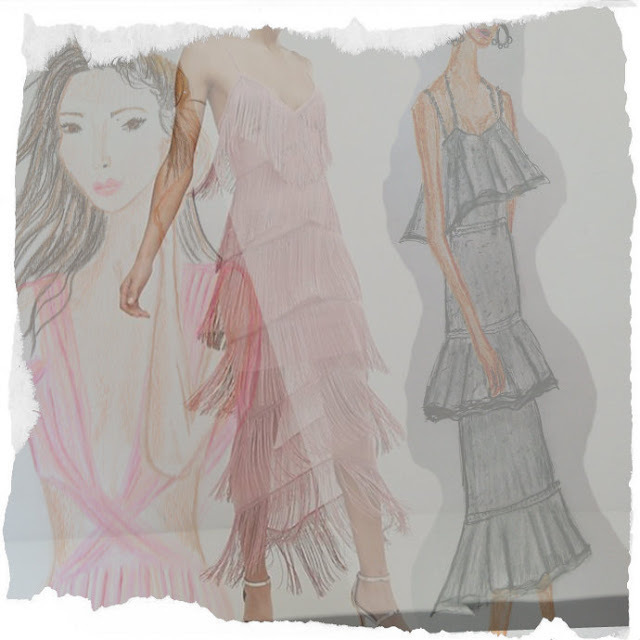 When it comes to choosing dresses, I like to consult my fashion illustration because they often inspire me. For example, this pink dress with tassels reminds me of two fashion illustrations I did in the past. With the wedding season being in full swing, many of us are faced with the old question: what to wear to a wedding? I wrote about this topic a number of times. A wedding is obviously an happy occasion, but it is also an occasion when we want to make sure we don't ruin the moment with wearing something inappropriate. I think most of us really enjoy being invited to something that is celebratory in its nature, be it a wedding, an engagement or a graduating party. I'm sure that man also have their doubts when it comes to choosing the right outfit, but women often find it even more stressful. A dress is a good choice, and it seems to be a popular choice for our ladies. However, choosing the right dress can be a little tricky. You'll want to look dressed up, but you still want to feel comfortable. No matter are you going to a wedding or to a date, feeling comfortable is important. If you don't usually wear dresses, it is even more important to choose something that will make you feel at ease. Some ladies feel comfortable in a maxi length, some feel best in midi length or something a bit shorter. With the wedding season being in full swing, many of us are faced with the old question: what to wear to a wedding? I wrote about this topic a number of times. A wedding is obviously an happy occasion, but it is also an occasion when we want to make sure we don't ruin the moment with wearing something inappropriate. I think most of us really enjoy being invited to something that is celebratory in its nature, be it a wedding, an engagement or a graduating party. I'm sure that man also have their doubts when it comes to choosing the right outfit, but women often find it even more stressful. A dress is a good choice, and it seems to be a popular choice for our ladies. However, choosing the right dress can be a little tricky. You'll want to look dressed up, but you still want to feel comfortable. No matter are you going to a wedding or to a date, feeling comfortable is important. If you don't usually wear dresses, it is even more important to choose something that will make you feel at ease. 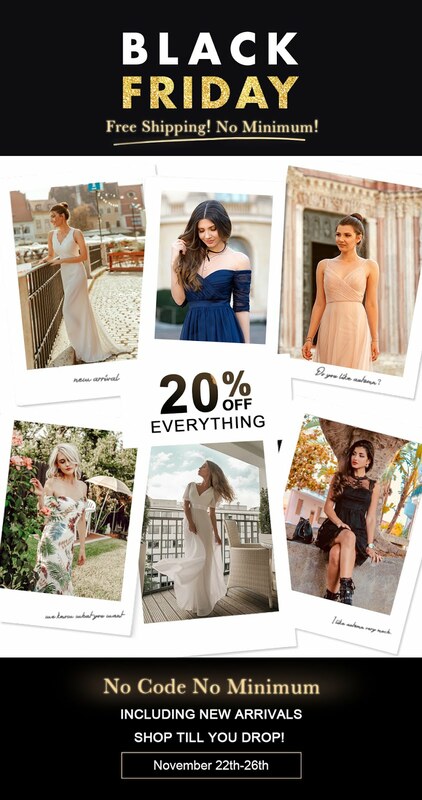 There is a great choice of women's fashion dresses these days. You don't have to go all out. Your dress doesn't have to made of sequins, if sequins aren't your thing. If your personal style is more toned down, you don't have to go for bold prints. You can always select a nice midi dress or a dress whose length is slightly above the knee. Depending on your preference, you can choose a dress in a bold or pastel colour. For example, above I have selected two dresses from Aquilabuy, one in red, the other in green. Both of them can be easily styled. The red one is a bodycon dress with statement sleeves. Have you noticed how popular bodycon dresses are? I think it has to do with the fact they can make us feel extremely feminine. Statement sleeves are still trending so I think this dress is a good choice. The other dress I have selected has a very clean siluette. Green is a nice colour choice and midi length is always very appropriate. What do you say? Do you like my choices? What kind of colours and cuts have you been opting for lately? How do you go about finding a perfect dress? Io sono molto per i vestiti lunghi e con le paillettes o le frange, sono molto anni 70! anche a me piacciano molto, questo vestito in rosa e' cosi bello! These illustrations are so pretty! Dear Ivana, you are really right, this can be fun and tricky to choose the outfit for such occasions but I know you always manage this challenge perfectly. As already mentioned a few times for such occasions a traditional Bavarian dress, a dirndl, is often my choice - and therefore it matches that I show exactly such an outfit on my blog today :) Have a happy mid of the week! Dirndl is a great choice. I don't have a traditional costume but I purchased a traditional shirt and I plan to wear it for a special occasion. 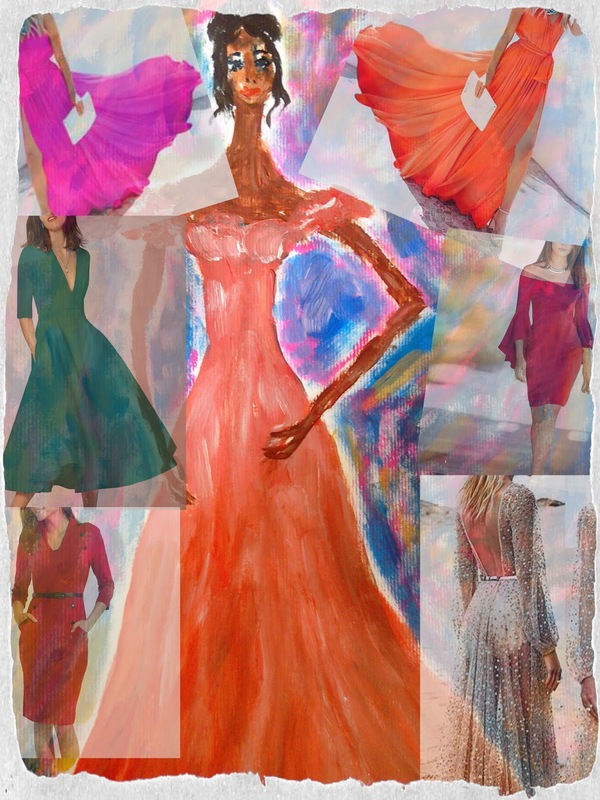 I can see how illustrating your ideas can help you make fashion decisions - likewise, finding ideas FROM your illustrations! I've always enjoyed your full-length gown drawings as they tend to look very romantic and feminine :) I know what you mean about the certain pressures that come with dressing for special occasions, especially when it comes to situations that require a certain level of respect in the dress code eg. church weddings etc. Hope you're having a fabulous week! I find it hard to find something that shows that I've put together effort into my look but at the same time, that I haven't put too much effort and that I don't want to outshine the newly weds. It is a hard balance to strike. I agree that choosing a dress to wear for a special occasion is equally fun and stressful and your tips are spot on. Looking good and appropriate for the event is important but I'm glad you mentioned comfort because one should always be comfortable in whatever they're wearing. That's always a major factor that I consider even when dressing up. how interesting we had a similar idea at the same time:). The illustrations are just awesome darling.